Palaeontologists have speculated on the preferred prey of Theropod dinosaurs for decades. These mainly meat-eating dinosaurs did not chew their food but bit into their victims and tore off chunks of flesh, a feeding technique named “puncture and pull”. In newly published research, scientists have looked at the serrations on the sides of Theropod teeth and assessed their role in feeding. An analysis of microscopic scratches and wear patterns on the teeth of several different types of Canadian and Spanish carnivorous dinosaur has revealed that the troodontid dinosaurs with their large, broad and hooked, serrations (denticles) may have specialised in hunting smaller, softer prey as their teeth might have been damaged if they had bitten into a struggling, large animal. The serrated teeth of Theropod dinosaurs provides evidence of preferred prey. The teeth in the picture have been scaled to the same crown height for comparative purposes. The teeth of meat-eating dinosaurs tend to be curved, with sharp, serrated edges (ziphodont), the shape and size of the tooth serrations (the denticles) varies considerably between different species. Tyrannosaurids such as the North American Gorgosaurus and dromaeosaurids such as Dromaeosaurus both have rounded, almost rectangular denticles, despite these animals being very different sizes, with the Gorgosaurus having much larger teeth. In contrast, the dromaeosaurid Saurornitholestes has more pointed denticles that, over time can become worn and then they resemble the serrations found on the tooth of Dromaeosaurus. Troodontids, such as Troodon have unique hooked denticles, that are proportionally much bigger than the denticles found on similarly sized Theropods. Troodon means “wounding tooth”, a reference to the large, distinctive serrations on its teeth. This new study under taken by University of Alberta scientists, along with colleagues from the Universidad de Zaragoza and the Universidad de La Rioja (Spain) and the Royal Ontario Museum, examined the strength of the teeth and their serrations to see whether they provided any clues about potential prey as these dinosaurs fed using the “puncture and pull” technique. Tiny scratches (highlighted in yellow) support the idea of puncture and pull feeding in Theropod dinosaurs. The picture (above), shows microwear patterns on three different Theropod teeth (scale bar = 100 um). Each pair of pictures shows the same section of tooth with the microwear and scratches highlighted in yellow on the picture (right). Two scratch orientations were present on all studied teeth, one oriented parallel to the border of the tooth, and one oriented 30°–40° to the tooth border, this supports the idea of “puncture and pull” feeding behaviour. The photographs at the top show the denticles of Pyroraptor, a dromaeosaurid from Laño, Spain. The middle photographs represent the tyrannosaurid Gorgosaurus from the Dinosaur Provincial Park (Alberta, Canada). The photographs (bottom) show the denticles of Troodon (T. inequalis), also from the Dinosaur Provincial Park (Alberta, Canada). The researchers used scanning electron microscopy to map the wear and scratches on individual serrations in conjunction with a statistical method (finite element analysis), to identify stress patterns in teeth as they were involved in feeding. It was concluded that the shape and strength of the dinosaurs’ teeth made them more or less vulnerable to breakage, forcing them to select different types of prey. For troodontids, their tooth serrations were particularly prone to stress and therefore not suited to coping with struggling prey. This suggests that although troodontids were of a similar size to many dromaeosaurs, they may have selected much smaller, less mobile prey, hinting at niche partitioning in those environments were dromaeosaurs and troodontids may have been coeval. Stress assessments of different Theropod teeth. The picture above shows plotted stress tests on three types of Theropod dinosaur teeth – Dromaeosaurus (top), the dromaeosaurid Saurornitholestes (middle) and a troodontid (bottom). The “hotter” the colour ie. red, orange, yellow, the greater the stress on that part of the tooth during a bite. The teeth of troodontids were identified as being particularly susceptible to breakage when biting into struggling prey. The researchers, which included renowned Ankylosaur expert Victoria Arbour of the Royal Ontario Museum and a former student at the University of Alberta working with Professor Phil Currie, who also contributed to the study, conclude that the microwear evidence supports the idea of “puncture and pull” feeding in Theropod dinosaurs and that troodontids may have favoured smaller prey than dromaeosaurids, as their teeth did not stand up so well to the stresses and strains of coping with struggling prey. Saurornitholestes demonstrates the puncture/pull feeding technique of Theropod dinosaurs. Dromaeosaurus and Saurornitholestes were well-adapted for handling struggling prey, whilst troodontid teeth indicate that these dinosaurs may have had a different diet. The Beasts of the Mesozoic Mountains accessory pack, features Troodon. New research suggests that Troodon may have fed on different prey when compared to dromaeosaurids. The scientific paper: “Puncture-and-Pull Biomechanics in the Teeth of Predatory Coelurosaurian Dinosaurs” by Angelica Torices, Ryan Wilkinson, Victoria M. Arbour, Jose Ignacio Ruiz-Omeñaca and Philip J. Currie published in “Current Biology”. Children in Year 1 compiled lots of facts about dinosaurs and prehistoric animals as part of a term topic on life in the past. The enthusiastic teaching team had challenged the pupils to conduct some independent research into dinosaurs and other creatures that lived before people. 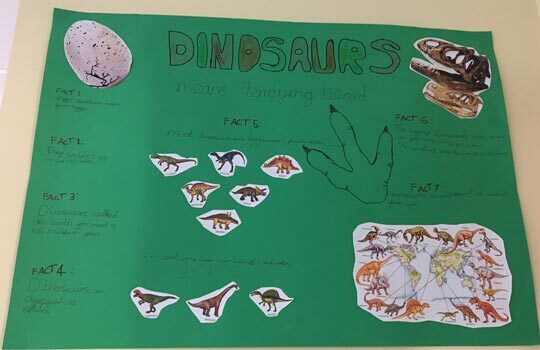 The children were given a choice, they could research a single animal such as Brontosaurus, Triceratops or Tyrannosaurus rex, or they could create a poster about dinosaurs in general. The only prerequisite stated by the teachers was that the children’s work had to include lots of information, lots of facts. Year 1 children design dinosaur posters. During our visit to the school to conduct a series of dinosaur workshops with the Year 1 classes, the children were keen to demonstrate their knowledge confidently asserting that dinosaurs laid eggs and that dinosaur fossils could be found all over the world, even in Australia! We provided a number of extension resources to help support the school’s scheme of work, including a challenge to the children to create a non-chronological report on the life and times of the famous scientist Sir Richard Owen, highly appropriate since one of the children was called Owen. Dinosaur facts compiled by Year 1 children. This poster features a lot of different dinosaurs including herbivores and carnivores. To date, something like 1,300 dinosaur genera have been described. Learning about dinosaurs provides plenty of opportunities for cross-curricular activities. For example, the children had been exploring the properties of different materials by making prehistoric animal models and this topic has lots of scope to include writing activities (fiction and non-fiction writing). Everything Dinosaur’s workshop leader challenged the classes (and their teachers), to produce a dinosaur themed poem. A piece of prose that features a prehistoric animal, an intriguing idea that helps the children explore different types of writing and gives them the opportunity to develop their vocabulary, introducing the idea of stanzas, cadence, verses and iambic pentameter. Subscribers to Everything Dinosaur’s newsletter received their latest bulletin this week. They were the first to know about the arrival of more stocks of the Rebor Velociraptor 1:18 scale replica “Winston”, as well as the arrival of more of the Rebor Yutyrannus huali figure, the Rebor Y-REX, the first 1:35 scale model produced by Rebor. Everything Dinosaur May newsletter announces Rebor models back in stock. Everything Dinosaur customers who had requested a model be reserved for them have already been contacted by team members. In a meeting with the senior management of Safari Ltd a few months ago, Everything Dinosaur was informed that the model making company was going to slim down its inventory. Three models have been retired, the Edmontosaurus, Inostrancevia and the Nigersaurus, expect more retirements to be announced by Everything Dinosaur in the near future. Also, rumoured to be consigned to extinction, is the Battat Terra Amargasaurus figure, this Sauropod dinosaur model, is believed to be out of production. Everything Dinosaur announces model retirements in its May 2018 newsletter – three Safari Ltd models (Inostrancevia, Nigersaurus and Edmontosaurus) plus one retirement from Battat (Battat Terra Amargasaurus). The model of the gorgonopsid Inostrancevia, part of the Wild Safari Prehistoric World model range was introduced along with the Edmontosaurus back in 2011. It is a shame to see these three figures out of production, but we can expect to hear of new model introductions to this award-winning range in the autumn. Safari Ltd model retirements in 2018. Rumours abound about the retirement of the Amargasaurus dinosaur model from the Battat Terra range. It is proving very difficult to find stocks, however, model collectors and dinosaur fans can rest assured, Everything Dinosaur has plenty of stock of this figure that is believed to have been withdrawn from production. One of our more unusual soft toys features in the May newsletter, the cute and cuddly giant squid soft toy. This colourful plush Cephalopod measures over eighty centimetres long from the tips of the tentacles to its rear end. We also had to mark the arrival of the first for 2018 Papo figures by giving the Papo cave man with spear, the Papo young Spinosaurus and the Papo Amargasaurus a mention. May newsletter 2018 – Papo models and a giant squid soft toy. With the disappearance of the Battat Terra Amargasaurus and the arrival of the Papo Amargasaurus model, it seems fans of this South American, long-necked dinosaur will be able to collect a replica of this dinosaur after all. Researchers from the China Agricultural University, the Nanjing Institute of Geology and Palaeontology and the Chinese Academy of Sciences, have discovered a new species of lacewing preserved in 100 million-year-old Burmese amber (burmite). The scientists have identified two lacewing larvae that show adaptations for mimicking liverwort plants. Mimicry and camouflage is relatively commonplace in the natural world, but evidence of this within the fossil record is extremely rare. New green lacewing larva Phyllochrysa huangi in (A) dorsal view and (B) ventral view. Lacewings are insects which are characterised by their very fine, reticulated wings. They are globally widespread and something like 2,000 living species have been described to date. As larvae and adults, they are voracious hunters and are popular with farmers and growers as they eat lots of pests, such as aphids. Fossils of these delicate insects are rare but specimens are known that date from the Jurassic. Liverworts are much older, they lack a vascular system and true roots tending to grow very close to the ground. Liverworts are thought to be similar to the very first land plants that evolved in the Silurian geological period. Despite liverworts having existed since the Palaeozoic, mimicry between insects and liverworts is extremely rare in both modern and fossil ecosystems. This discovery, reported in the academic journal “Current Biology” represents the first record of liverwort mimicry by fossil insects and brings to light an evolutionary novelty, both in terms of morphological specialisation as well as plant-insect interaction. The larvae have broad flanges on their abdomen and thorax that resemble the fleshy, ribbon-like fronds of liverworts. The insect which has been named Phyllochrysa huangi, is the only known species of lacewing with distinctive foliate lobes on the larval body. These newly described insects are the first evidence of direct mimicry in lacewing larvae. This camouflage may have helped the vulnerable larvae to avoid detection by predators, or they might have used this body bauplan to help ambush potential prey. A life reconstruction of two Phyllochrysa huangi hiding amongst liverworts. The larvae are highlighted by red arrows. The researchers conclude that these fossils preserved in amber demonstrate a hitherto unknown life-history strategy amongst these types of insect, a strategy that apparently evolved from a camouflaging ancestor but did not persist into modern times with this lineage. The amber from Burma (Myanmar) has provided palaeontologists with an astonishing insight into life in a Cretaceous tropical rainforest. Numerous types of invertebrate have been named, including damselflies, spiders and blood-sucking ticks that may have fed on the blood of dinosaurs. The remains of larger creatures have been found preserved in amber too, including the feathered tail of a dinosaur and a baby enantiornithine bird. Fossilised baby bird preserved in amber: Watch the Birdie! The globally widespread extant liverworts consist of over 9,000 named species. Although, like the lacewings, their fossil record is very poor, it seems likely that they began to become much more diverse during the Cretaceous as the rapidly evolving angiosperm trees provided new habitats for them. Just like their modern counterparts, Cretaceous liverworts grew on the leaves and bark of trees as well as on other plant surfaces. It is logical to assume that the camouflaged lacewing larvae also probably lived on trees which were densely covered by liverworts, with the lacewing’s liverwort mimicry aiding their survival. Readers of Prehistoric Times magazine have voted the Wild Safari Prehistoric World Feathered T. rex model the best dinosaur toy of 2017. The figure faced tough competition, but it had a number of factors in its favour. Firstly, it is a model of a Tyrannosaurus rex, the most popular of all the prehistoric animals and secondly, this skilfully crafted replica depicted T. rex with a shaggy coat of feathers, a modern interpretation of this iconic dinosaur. Wild Safari Prehistoric World Feathered T. rex. Standing a little under fifteen centimetres high and measuring an impressive 32 centimetres long, this Tyrannosaurus rex figure depicts the “Tyrant Lizard King” with a coat of reddish-brown protofeathers, with more prominent quills on the top of the formidable skull and the running down the back of the neck. The feathers on the back of the head and neck suggest that these quills might have played a role in visual display, the body feathers as shown in this replica, would have made a very effective coat, helping to keep this reptile warm. The designers at Safari Ltd chose to make the snout and the underside of the neck bare, a similar characteristic is seen in extant vultures. Many species of vultures such as the Lappet-faced (Torgos tracheliotos) and the White Rumped vulture (Gyps bengalensis) have heads and necks which are devoid of feathers. A mistake often made, is to assume that this lack of feathers on the neck and head prevents the bird from getting caked in blood as it reaches inside carcasses to feed. This adaptation may assist in helping the vulture to keep clean, but it is now known that the bare head and neck play a role in thermo-regulation, helping the bird to cool down. Perhaps the design team at Safari Ltd had considered this research before finalising the feathery features on their 2017 dinosaur model. The back of the neck of the T. rex model has prominent feathers. Safari Ltd have won this accolade on several previous occasions, in 2015 the Wild Safari Prehistoric World Sauropelta model was voted number one, whilst last year the Wild Safari Prehistoric World Iguanodon figure was honoured. Previous award winners (top) the Iguanodon figure in 2016 and the Sauropelta, winner in 2015 (bottom). It is the attention to detail that impresses. 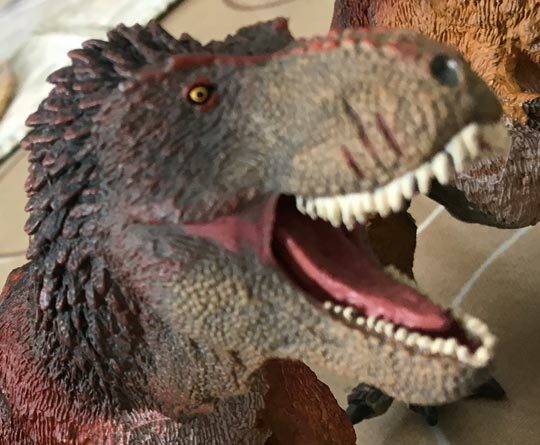 This product line has a deserved reputation for the excellent painting of models, but it is the fine details that really make the feathered T. rex figure stand out from the pack. Take, for example, the scratches and scars on the muzzle of the dinosaur model. Face biting amongst Tyrannosaurs has long been suspected and the sculptors at Safari Ltd were keen to incorporate evidence of this behaviour into this T. rex model. Note the prominent scars on the muzzle of the T. rex figure (face biting). The concept art linked with the 2017 launch of the T. rex model. The children in Year 2 at Newport Infant School (Shropshire), had an exciting day today when one of our dinosaur experts visited them to kick-start their new term topic all about dinosaurs, fossils and life in the past. The three classes that make up the Year 2 cohort – Hedgehog, Squirrel and Deer had been set a challenge by their teachers over the holiday period. Could the children create something to do with dinosaurs and then bring it into school? The children set about this task with relish and our dinosaur expert was able to see the results of the children’s hard work, plus we suspect, the efforts of one or two grown-ups that also got involved in the project. Children in Deer class (Year 2) made dinosaur models including some amazing, blue dinosaurs. The hard-working and dedicated teaching team deliberately kept the brief for the children quite vague. It did not matter what the pupils produced, so long as it had something to do with dinosaurs. A wide variety of different craft ideas were showcased as our dinosaur expert toured the three classrooms. There were lots of prehistoric animal models, with many different types of materials used including cardboard, modelling clay and papier mâché. Some children had chosen to produce a poster or a set of dinosaur fact sheets. We spotted a poster in Hedgehog class which examined the diets of different dinosaurs, herbivore, omnivore or carnivore. This poster was very timely, as we found out that the teachers had set the children a spelling list for them to learn this week and the words carnivore, herbivore and omnivore were included on the list. Year 2 children explore dinosaur diets (Hedgehog class). This large primary school provides lots of exciting learning opportunities and the teaching team have created an imaginative scheme of work for the summer term. The colourful prehistoric animals and cleverly created posters have set the scene for what will be a fascinating and varied topic. During our visit, we set the classes a variety of challenges ourselves, these included learning about reptiles alive today, producing poems about dinosaurs and researching famous fossil hunters such as Mary Anning. There are some very impressive prehistoric whale exhibits in the ancient whales gallery at the Frankfurt Natural History Museum (Frankfurt, Germany). The Frankfurt Museum, also known as the Senckenberg Museum, houses one of the largest natural history collections in the whole of western Europe. The extensive galleries highlight biodiversity and tell the story of the evolution of life on Earth. One of the highlights of the entire collection is the substantial cetacean gallery that includes a number of mounted exhibits of ancient prehistoric whales. The magnificent ancient whales gallery at the Frankfurt Natural History Museum (Germany). A team member from Everything Dinosaur spotted a glass case that contained the fossil skull and jaws of the Late Eocene whale Basilosaurus, fossils of which are known from New Zealand, North Africa, the United States and Europe. This early toothed whale was an apex predator, reaching lengths in excess of twenty metres and perhaps weighing more than 10,000 kilograms. Basilosaurus was popularised after it appeared in the BBC television series “Walking with Beasts”, a sequel to the famous “Walking with Dinosaurs” television series that was first aired in 1999. Episode two of “Walking with Beasts” entitled “Whale Killer” told the story of a pregnant Basilosaurus and her search for enough food to sustain herself and her unborn calf as the world entered a period of climate change that would lead to a significant extinction event. An illustration of Basilosaurus. A Basilosaurus scale drawing. Tortoises, terrapins and turtles, collectively classified into the Order Testudines (sometimes referred to as the Chelonii), are a very ancient group of reptiles. They were around before the crocodilians and the dinosaurs. Surprisingly, not that much is known about the evolutionary origins of extant species, but newly published research by the University of Alabama at Birmingham, has identified an important missing link in the lineage leading to modern sea turtles. A new species of Late Cretaceous sea turtle has been named and described in a paper published in the academic on-line journal “PLOS One”. The turtle, which had a shell more than a metre in diameter, has been named Peritresius martini. The turtle’s name honours amateur fossil collector and retired scientist George Martin, who discovered the specimen in Lowndes County, Alabama and donated the fossil to the Alabama Museum of Natural History (Tuscaloosa, Alabama). The known fossil elements of P. martini with a line drawing showing their position in life. In the picture (above), the known fossil elements are shown including elements from the carapace, the plastron and the pelvic girdle (centre image). The fossil bones have been superimposed (in green) onto a line drawing showing a life reconstruction of the marine turtle. The new species of sea turtle (P. martini), swam in the shallow waters off the coast of Appalachia between 73 and 70 million years ago. It has been compared to the extant (Chelonia mydas), the green sea turtle, that can be found off the coast of Alabama today. Alabama in the Late Cretaceous. The picture above shows the biostratigraphy and the palaeobiogeography of the Late Cretaceous fossil turtle discoveries of North America. Note P. martini is marked by the yellow star. 1). Nichollsemys baieri – a sea turtle from the Bearpaw Formation of Canada dating from the Late Campanian. 2). Porthochelys laticeps – a sea turtle from Kanas that lived during the Coniacian through into the Santonian faunal stages of the Late Cretaceous. 3). Toxochelys latiremis – a sea turtle known from western Kansas with a wide temporal distribution ranging from around 88 – 73 million years ago. 4). Ctenochelys stenoporus – known from central Alabama. 5). Prionochelys nauta – from the Mooreville Chalk Formation of Alabama. 6). Toxochelys moorevillensis – from the Late Santonian and the Early Campanian which was named in 1953. 8). Thinochelys lapisossea – from the Selma Formation of Alabama. 9). Zangerlchelys arkansaw – a sea turtle from the Marlbrook Marl Formation of Arkansas. 10). Peritresius martini – the newly described sea turtle from the study. 11). Peritresius ornatus – a closely related marine turtle species to P. martini that was first named and described in the mid-19th Century. 12). Euclastes wielandi – a primitive sea turtle dating from the Late Maastrichtian faunal stage of the Cretaceous. 13). Catapleura repanda – a Late Cretaceous (Maastrichtian faunal stage), turtle associated with Greensand marine deposits of New Jersey. However, without the skull and limb bones, the appearance and habits of P. martini can only be speculated upon. The scientists have no information on what it fed upon, how it moved or whether this turtle was a creature of the coastal seas or deeper water. The discovery of this new species of Peritresius helps to fill a gap in the Stem Cheloniidae, a group of ancient sea turtles that are related to the majority of sea turtles found today. Time-calibrated, strict consensus phylogeny of select fossil and extant Testudine species. P. martini is highlighted by the purple star. Everything Dinosaur acknowledges the help of a University of Alabama at Birmingham press release in the compilation of this article.